A new book edited by U.S. Forest Service emeritus scientist Wayne Swank and Virginia Tech professor Jack Webster and published by Oxford University Press brings together findings from more than 30 years of collaborative research by the Forest Service and the Long Term Ecological Research (LTER) program on the Coweeta Experimental Forest (Coweeta) near Otto, North Carolina. The research centers on the long-term ecological responses of a southern Appalachian forested watershed following clearcut logging in 1977. The 14 chapters by Forest Service and university scientists range across tree regrowth, stream water quality, and effects on stream macroinvertebrates. Each chapter highlights the importance of long-term data collection and research. "We're frequently asked, just what is long-term research in forested systems," said Swank. "We consider the minimum window of investigation for forest ecosystems to include the lifespan of the forest of interest, which can easily include several generations of scientists. This book provides a comprehensive update on the long-term study of Coweeta Watershed 7, which so far spans nearly 40 years." In 1974, then Forest Service scientist Swank and colleagues at the University of Georgia proposed research and where funded by the National Science Foundation (NSF) to examine nutrient cycling in Watershed 7 following clearcut cable-logging. The study was later incorporated into the NSF LTER program established at Coweeta in 1980 and based at the University of Georgia. The study was unique in that it answered both practical questions related to forest resource management in the southern Appalachians, as well as fundamental hypotheses about hydrologic and ecological processes driving the responses. There are now decades of data and published findings from the study. Following cutting, high rates of primary production, sequestration and storage of nutrients during early succession moderated nutrient loss from the watershed. Later in succession, the death of black locust trees caused by stem borers contributed to elevated nitrogen loss from the watershed, which can limit productivity since nitrogen is essential to plant growth. 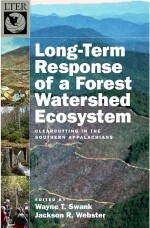 Clearcutting experiments similar to that at Coweeta were conducted at Hubbard Book and Fernow, long-term Forest Service experimental forests located in the Appalachian Highlands Physiographic Division. Comparisons are made across all three sites between hydrologic and nutrient responses, and factors contributing to similarities and differences between responses. One of the novel features of the research reported in this volume is that it captures watershed responses over a large number of disturbances - in addition to logging these include drought, record rainfall, hurricanes, insect outbreaks, and diseases. The research thus increases awareness about the effects of disturbance on forest ecosystems as well as the need to understand these processes at greater levels of complexity. The Watershed 7 study was also important for the level of student participation in the research. Webster observed, "To me, one of the most important aspects of the Watershed 7 study has been the educational component. In addition to graduate students who actually did their thesis research on Watershed 7, many other graduate students and undergraduate students participated in the research. My publications of research on Watershed 7 include 16 student co-authors, most of whom are now professionals in stream ecology. Additionally, every spring I take a group of undergraduate students to Watershed 7, and we stand next to Big Hurricane Branch and talk about how clearcut logging affects the ecological dynamics of streams." "Some forest processes simply cannot be forecast accurately with data from short-term studies," said Swank. "For example, water quality and nutrient responses on Watershed 7 changed with every decade of data. Building models to forecast chemistry, nutrient, and carbon responses using data from the first 5 or 10 years would have given us different answers from what we actually observed in the long-term record. Watershed 7 continues to provide a rare opportunity for researchers." The book is 253 pages long, with 14 chapters by 27 contributors. It can be purchased from Oxford University Press or Amazon.com.